The supervision of building construction was entrusted to George Meikle Kemp, and the contract was assigned to Mr David Lind who had previously built the Tolbooth Church on Castlehill. It was also decided to use Binny sandstone from Uphall, West Lothian to build it. Kemp had convinced the Committee to allow a foundation on bedrock to be excavated, due to the proposed height of the monument and the fact that the Caledonian Railway Company proposed to tunnel under Princes Street within eight feet (2.6m) of the foundation. He then invited several friends to witness the laying of the 'real' foundation stone. I am directed by the Right Worshipful Master of the Edinburgh Lodge Saint Andrews, to inform you that the Foundation Stone of the Metropolitan Monument in memory of Sir Walter Scott is to be laid with Masonic Honours, on Saturday 15th, upon which occasion you are respectfully invited to attend. The Brethren will assemble in the Quadrangle of the University at 1 o’clock precisely - Costume - Full Dress Black, with White Gloves, Clothing Dark Blue Sash and Apron, to which it is hoped that all present will adhere. No brother can be admitted without a ticket which may be had of the RWM Bellevue Cottage. The Treasurer, 62 Leith Street, or Brother Geo Vallance, 11 Register Street, at 11 o’clock forenoon. The Brethern will dine the same day in the Crown and Anchor Tavern, High Terrace at 5 o’clock precisely. Ticket 2/6. The Lodge will meet next Friday evening at half past to make the final arrangements. Below is one of the admission tickets sent to the Freemasons. John Brown sc N.Bridge Edin. Around the text are depictions of historical Scottish and Gothic items, such as swords, armour, thistles, the Scottish coat of arms and at the bottom are Masonic regalia and insignia. 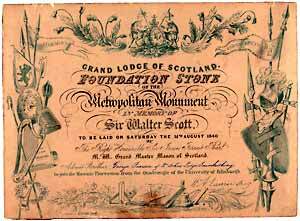 On 15th August 1840, the 69th anniversary of Scotts death, the official foundation stone was laid. Edinburgh declared a public holiday and large crowds gathered. In the foundations were deposited a glass jar 'time capsule' and two bronze plaques - one from the Freemasons, the other celebrating the author. ‘To Commemorate the Laying of the Foundation Stone of the Monument at Edinburgh in honour of the Immortal Scott. This trowel to be used at the ceremonial was presented to the Right Honourable Sir James Forrest of Comiston Bart., Lord Provost of Edinburgh, Most Worshipful Grand Mason over all Scotland. The trowel can be found on display at the Writers’ Museum, Lady Stair’s Close, Lawnmarket, Edinburgh.